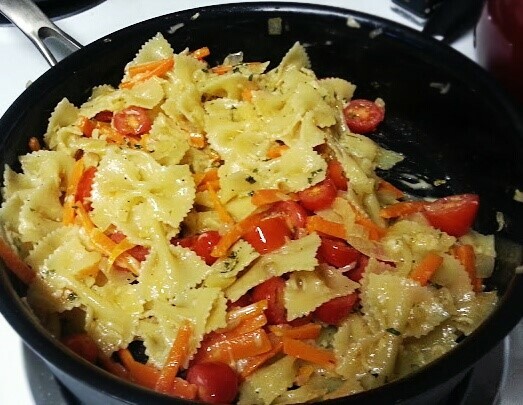 This pasta recipe is one of my favorites. It combines the garlic butter sauce from scampi with the vegetables from Primavera. 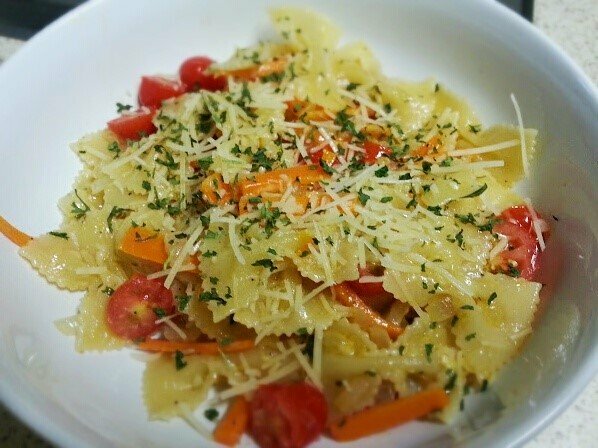 I can’t think of a better combination for a light pasta dish that’s a great alternative to Alfredo or spaghetti. Before you begin cooking, you’ll need to do a little chopping and prep work. Anytime you need to chop vegetables, I’d recommend using a good quality set of knifes. When my husband and I got married, we received a set of Ginsu knives for a wedding gift and I have been very happy with them. I love using the chef’s knife, especially for recipes like this one. For your prep work, peel and Julienne 2 medium carrots, dice 1 small onion, mince two cloves of garlic, and cut 1 cup of cherry tomatoes in half. Bring a pot of salted water to a boil, add 2 cups of bow tie pasta, and cook according to package directions. Drain and set aside. 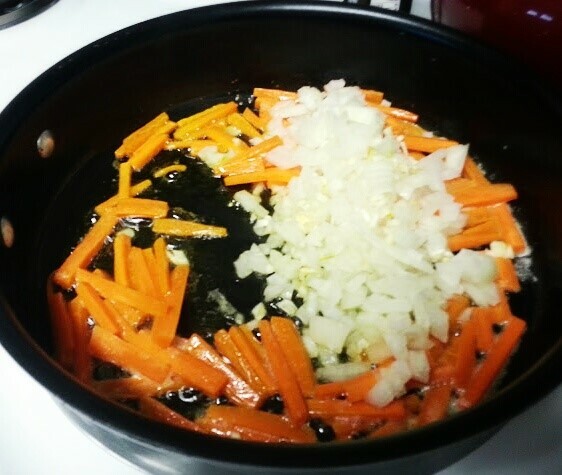 Add 2 tablespoons of butter, 1 tablespoon of olive oil, and the carrots, to a saucepan over medium heat. Saute until the vegetables are somewhat soft, about 2 to 3 minutes. Next add the onion and garlic and cook until the all vegetables are fully cooked. 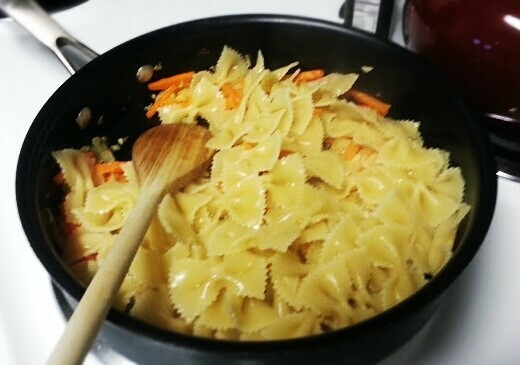 Add the remaining tablespoon of butter, the cooked pasta, and Parmesan cheese to the vegetables. Toss until the pasta is well coated. Add the cherry tomatoes and fresh parsley to the pasta and gently combine. Garnish with extra Parmesan cheese and parsley before serving. Bring salted water to a boil and cook pasta according to package directions. Drain. In a saucepan, melt 2 tbsp butter and oil. Add carrots and saute until somewhat soft. Add onions and garlic and cook until all veggies are fully cooked. Add remaining tbsp of butter, cooked pasta, and Parmesan cheese. Toss until pasta is well coated. Add tomatoes and garnish with extra Parmesan cheese and parsley.